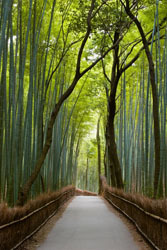 Bamboo fabric is a natural textile, a viscose, made from bamboo pulp. It’s soft, light and strong and has excellent wicking properties. The process to create fabric from bamboo is relatively new so its natural properties are still being discovered. It’s hypoallergenic and retains its natural antibacterial properties. Many people who experience allergic reactions to other natural fibers, such as wool or hemp or cotton, find comfort in bamboo. Bamboo fabrics can look and drape like a combination of silk or merino wool but you can machine wash them on the gentle cycle and dry them in the drier or on the clothesline. It has a reputation for being incredibly breathable, thermal regulating, and wicks moisture better than many polyester performance fabrics. Bamboo fabric is absorbent, fast drying, and will fight odors caused by bacteria. It keeps you dryer, cooler, and noticeably more comfortable than any other cotton or polyester fabric. Our bamboo fabric is free of chlorine and passes flammability requirements without the addition of formaldehyde. We strive to acquire our fabrics from companies producing bamboo viscose with the latest low carbon footprint processes and from those companies practicing fair labor with good working conditions. We also try with ever increasing success to purchase material made in the USA. Bamboo is the perfect fabric for wonderful, wearable clothing, especially our original Hand Tied and Dyed... One of a Kind... Three to a Pair, Always a Match socks and other garments and accessories. We are all unique individuals on this planet, right? Why shouldn’t every pair of socks or your scarf be 100% original as well?